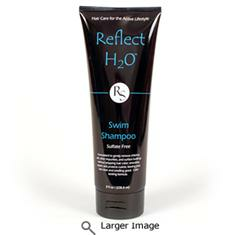 REFLECT H2OTM Swim Shampoo Swim Shampoo that prevents green hair! Reflect Sports swimming shampoo has been precisely formulated to prevent green hair, get chlorine out, strengthen and promote the growth of distressed and damaged hair and protect your hair color while keeping it healthy, hydrated, shiny and smelling good. Superior ingredients with stated end benefits were selectively chosen including, pro vitamin B5, vitamin E, wheat amino acids, keratin amino acids, silk amino acids, hops, and UV absorber. Do use immediately after swimming. Do massage into hair creating lather. Do rinse thoroughly after a few minutes for best results. Do use daily as your favorite shampoo. Do lather and wash your skin. Gently removes chlorine from your hair. Gently removes copper deposits that can cause green hair. Gently removes salts, other impurities, and surface build-up, without stripping hair color. Smoothes, repairs, and protects cuticle. Leaves hair clean, shiny, and smelling good. What are the benefits of using a sulfate free swimming shampoo? There is an active ingredient in every shampoo that is called the “SURFACTANT” which is the “detergent cleaning portion” of the formula. For the past 20 years almost every shampoo has used the surfactant Sodium Lauryl Sulfate, SLS or Ammonium Lauryl Sulfate, ALS. Why? Because they are very inexpensive and they make lots of lather and foam. Lather and foam often get the most attention but have zero to do with the quality of the shampoo. The shampoo industry is leaning towards sulfate free surfactants because they are far less damaging to hair, which is very appealing to any consumer, especially to swimmers.